As noted in our Strategy Note “Getting Ready for GDPR”, the new General Data Protection Regulation (GDPR) represents the most significant change in privacy regulation in twenty years. Many in the advertising ecosystem are concerned that entire programmatic stacks will require significant reinvestment and rebuilding because of GDPR. However, we believe these concerns can be alleviated by understanding what GDPR requires and matching these requirements to a minimal viable solution from which stakeholders can use as a foundation for comprehensive compliance. Indeed, advertisers and publishers will likely need to undergo some degree of technology change, but the pain and expense of making these changes can be substantially minimized and turned into a business advantage. In particular, we believe that advances in blockchain technology have the potential to help support a robust data-driven advertising ecosystem in an environment of more stringent regulation. Not just applicable to crypto-currency, blockchain provides a potentially eloquent and viable solution that not only mitigates GRPR risks, but also solves a range of programmatic transparency and supply chain management issues that remain unresolved today. We strongly advise advertisers and publishers to look at GDPR challenges as a glass half full and as a catalyst to capture a unique competitive advantage. 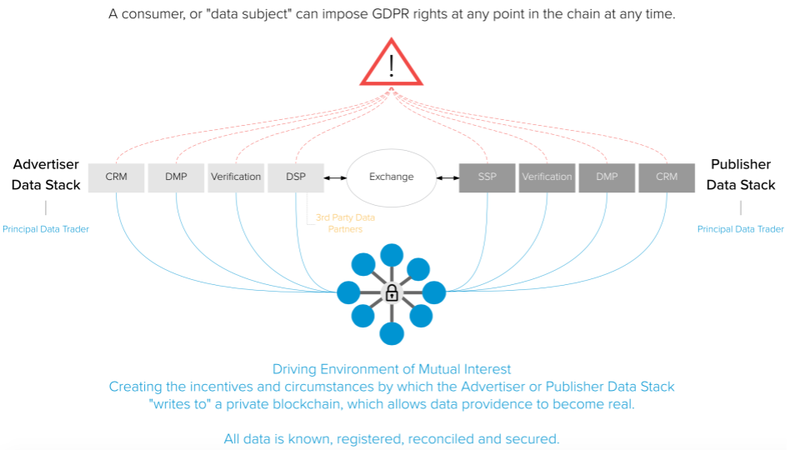 Although blockchain is in the early stages of testing in the programmatic ecosystem, its immediate potential to solve GDPR needs is appealing on several levels. For advertisers and publisher stakeholders in the EU and elsewhere interested in bringing blockchain into their consideration set, we recommend taking the following five steps. Needless to say, in times of urgent change nothing can replace a stakeholder desire to turn a serious and complex constraint into a giant leap opportunity. Get informed about the GDPR — See series of digestible materials below. Join open-source industry groups such as AdLedger.org to accelerate information gathering and institutional knowledge about blockchain. Effective implementation of blockchain to ensure data providence will require adoption across the advertising value chain, including advertisers, DMPs, DSPs, ad exchanges, and publishers. Create a starting point Proof-of-Concept use case and implement it in an accelerated manner in order to build out a definitive blueprint and investment case. Seek an advisory service that can check your readiness level, build an implementation strategy that ensures compliance and helps your marketing team lean into potential solutions such as blockchain. Establish a list of quick wins and communicate signs of momentum early and often to internal and external stakeholders.